Bitly launched a major update and redesign of its link shortening service today that, in the eyes of many of its users, de-emphasizes some of its core feature. Instead of being able to just copy and paste a link, users now have to go through a few extra steps to get their shortened links, for example. This extra complexity brings many new features to the service, but some of its users are anything but happy about the changes. With this update, Bitly is becoming more of a social bookmarking site than “just” a link shortener. Its users, however, were taken aback by these changes. They are, after all, just trying to shorten a few links and track their analytics. 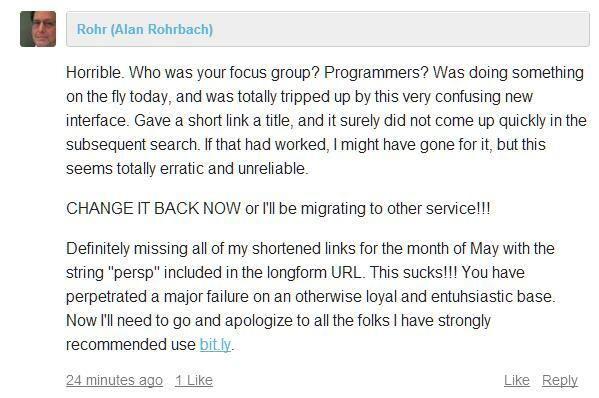 For the most part, they aren’t looking for Delicious replacement in their link shortener. Looking at the comment thread on the Bitly blog, it’s pretty clear that this update took users by surprise. While Bitly had hinted at the updates last month, the company never shared the exact details of today’s changes before actually putting them into action. As Bitly’s CEO Peter Stern told me, the company anticipated the negative reaction: “It’s the response from the vocal minority who are quick to complain about any change. We put a great deal of thought and effort into making the change as minimal as we could, but we recognize that people don’t like change.” What we are not seeing, said Stern, is all the users who are now interacting with features that had always been available on the site but were difficult to use. A radical change like this will always upset some people, especially if your service is aimed at mainstream users. Sadly, that’s just the way the Internet works these days. 2 features I wish the new @bitly had: 1-click copy button when shortening links (why the extra steps?) & more than 30 days of click data. And no, @bitly, I don’t want to save every link that I shorten. I have no idea why this is so irritating, but it really REALLY is.